TH E M R EP O RT | 7 MONTH IN REVIEW 1 President Donald Trump signed an executive order calling for the review of the Dodd-Frank Wall Street Reform and Consumer Protection Act. At his opening address to Congress in March, he also discussed deregulation, vowing to impose a new rule that would ensure "for every new regulation, two old regulations must be eliminated." 2 Along with 33 other Republican lawmakers, Jeb Hensarling (R-Texas), House Financial Services Chairman, issued a letter to Federal Reserve Chair Janet Yellen demanding the Fed wait for the Senate to confirm a federal banking regulator before proposing any new rules. Under the Congressional Review Act, Congress can block Fed regulations with a majority vote and the backing of the President. 3 According to the Federal Housing Finance Agency, mortgage rates have risen once again, jumping from 3.91 percent in December to 4.17 per- cent in January. The rate on convention- al 30-year fix-rate mortgages increased from 4.08 percent to 4.37 percent for the same time period. 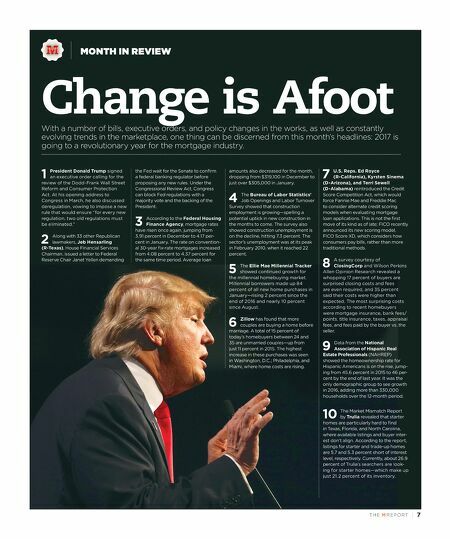 Average loan Change is Afoot With a number of bills, executive orders, and policy changes in the works, as well as constantly evolving trends in the marketplace, one thing can be discerned from this month's headlines: 2017 is going to a revolutionary year for the mortgage industry. amounts also decreased for the month, dropping from $319,100 in December to just over $305,000 in January. 4 The Bureau of Labor Statistics' Job Openings and Labor Turnover Survey showed that construction employment is growing—spelling a potential uptick in new construction in the months to come. The survey also showed construction unemployment is on the decline, hitting 7.3 percent. The sector's unemployment was at its peak in February 2010, when it reached 22 percent. 5 The Ellie Mae Millennial Tracker showed continued growth for the millennial homebuying market. Millennial borrowers made up 84 percent of all new home purchases in January—rising 2 percent since the end of 2016 and nearly 10 percent since August. 6 Zillow has found that more couples are buying a home before marriage. A total of 15 percent of today's homebuyers between 24 and 35 are unmarried couples—up from just 11 percent in 2015. The highest increase in these purchases was seen in Washington, D.C.; Philadelphia, and Miami, where home costs are rising. 7 U.S. Reps. Ed Royce (R-California), Kyrsten Sinema (D-Arizona), and Terri Sewell (D-Alabama) reintroduced the Credit Score Competition Act, which would force Fannie Mae and Freddie Mac to consider alternate credit scoring models when evaluating mortgage loan applications. 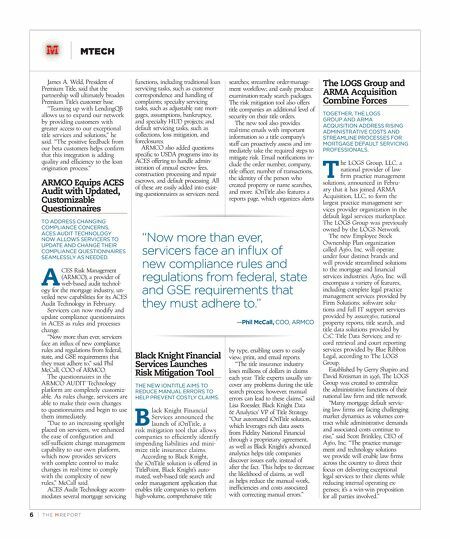 This is not the first move of its kind as of late; FICO recently announced its new scoring model, FICO Score XD, which considers how consumers pay bills, rather than more traditional methods. 8 A survey courtesy of ClosingCorp and Wilson Perkins Allen Opinion Research revealed a whopping 17 percent of buyers are surprised closing costs and fees are even required, and 35 percent said their costs were higher than expected. The most surprising costs according to recent homebuyers were mortgage insurance, bank fees/ points, title insurance, taxes, appraisal fees, and fees paid by the buyer vs. the seller. 9 Data from the National Association of Hispanic Real Estate Professionals (NAHREP) showed the homeownership rate for Hispanic Americans is on the rise, jump- ing from 45.6 percent in 2015 to 46 per- cent by the end of last year. It was the only demographic group to see growth in 2016, adding more than 330,000 households over the 12-month period. 10 The Market Mismatch Report by Trulia revealed that starter homes are particularly hard to find in Texas, Florida, and North Carolina, where available listings and buyer inter- est don't align. According to the report, listings for starter and trade-up homes are 5.7 and 5.3 percent short of interest level, respectively. Currently, about 26.9 percent of Trulia's searchers are look- ing for starter homes—which make up just 21.2 percent of its inventory.